Loh bak bun (white carrot/radish 'flat cakes') is my mom's favorite Chinese go or kuih before she forgot it's her favorite. She bought it whenever she saw it on breakfast stalls and now I buy it for her whenever I see them. She needs me to remember things for her and sometimes it's very frustrating for me. Ok, it upsets me sometimes but I know the frustration comes from not wanting to accept that she's not the way she used to be. Mom made very good kuih (a Malay word that originated from the Hokkien word koe for teatime snacks, usually made of rice or glutinous rice flour and steamed) but her generation never wrote their recipes down in paper or blogs so many recipes have disappeared. There is hope though because daughters and sons remember the taste of what their moms (or dads) cooked and through many tries, family recipes can be recovered. 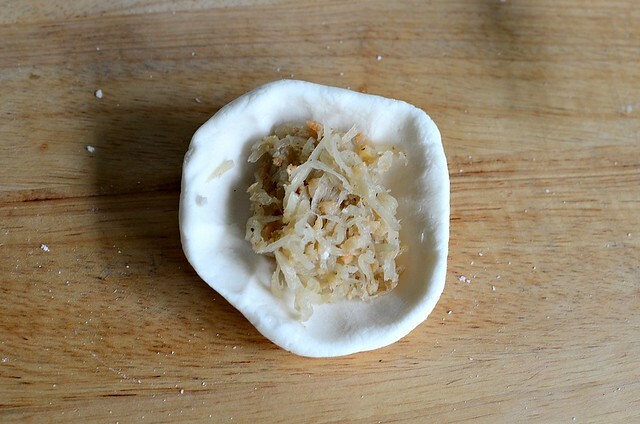 I got the recipe for loh bak bun (the bun is pinyin and doesn't mean bun as in steamed flour buns, but it means a flat 'cake' or snack) right on my fourth try. The first time, mom insisted on adding rice flour to the glutinous rice flour so that the bun wouldn't be too sticky. The bun turned out hard and got harder when it cooled. The second batch was made with pure glutinous rice flour and I liked the stickiness but there was a floury texture, like the bun wasn't cooked through even though I re-steamed it. The most common bun recipe, especially in West Malaysia I think, is made of wheat starch and tapioca flour, like for ha gow. 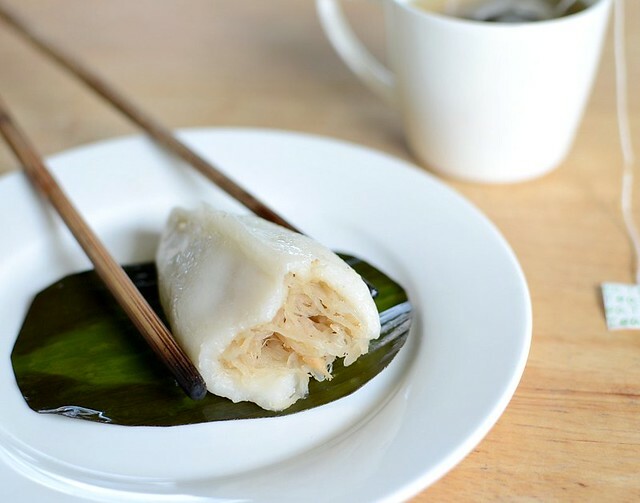 The wheat starch makes the wrapper or 'skin' translucent and shiny while the tapioca starch gives the skin some structure because wheat starch, when cooked, is very soft and slightly sticky. I was sure that's not how our local loh bak bun are made so wheat starch was out for me. The third time, I made the wrapper or 'skin' with glutinous rice flour and cornstarch and it was totally not the right texture. The fourth time, I added potato starch which I had plenty of. Bingo. The texture of my fourth batch of loh bak bun was soft, smooth, sticky, slightly (and very slightly, I didn't want it any more than that) chewy--exactly how I like it. The filling was delicious and I gobbled two bun within a minute. How am I going to face the people in KL next week, with my wobbly thighs and turkey neck and droopy buns (the human type)? Why can't we just eat without growing fat? Besides being a snack, loh bak bun is eaten at breakfast too. What I do is fry the filling the night before so that it cools and the liquid dries up. The next morning, it just takes 3 minutes to make the dough, 5 minutes to fill the bun (cut the banana leaves night before) and another 5 to 7 minutes to steam them. I make my bun twice as big as what I get at the stalls. It's robbery at the stalls because the loh bak buns are now 80 sen each, some RM1, and they are half the size of my palm with hardly any filling. I made about 20 large loh bak buns for RM5/USD1.60. RM1.50 for the radish, RM1.00 for the dried shrimps, about RM2.50 for the glutinous rice flour and the banana leaves are from my garden. That's 25 sen for each bun, and they are nearly twice as big as and with lots more filling than the ones sold in stalls. I'd get rich if I have a breakfast stall at some kedai kopi. 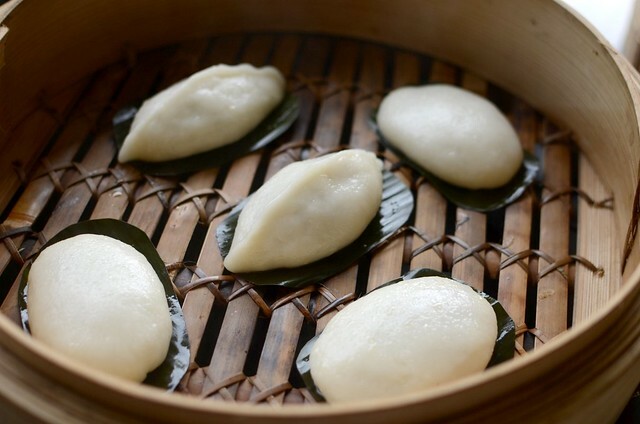 The traditional shape for loh bak bun is the flat pillow shape. 1. Grate the radish (I don't remove the skin) into very fine strips. Wash the dried shrimps, soak 5 minutes in water to soften (keep the water) and then mince them finely. 2. Heat up a wok/frying pan and add 2 T veg oil. Fry the dried shrimps until fragrant, about 3 to 5 minutes or until you can't standing their jumping about. Add the radish strips, then season with salt, chicken granules (commercially, msg is used) and plenty of white pepper. This snack should have the flavor of the radish, dried shrimps and white pepper. Add the soaking liquid from the dried shrimps, cover the wok for a couple of minutes, then remove it and continue to fry under medium heat until the radish is transparent and all the liquid has evaporated. Taste and season if necessary. Dish out and cool. 3. Put the flours into a large bowl and pour the boiling water over, using a pair of chopsticks or spoon to mix the water and flours in circles. The resulting lumps of flour will become semi-transparent. If you don't use boiling water, the dough will break apart and be hard to shape. 4. Put the dough on the counter and knead until smooth, about 1 minute only. 5. Divide the dough into 20 or more portions, rolling them on your palms to make them smooth. 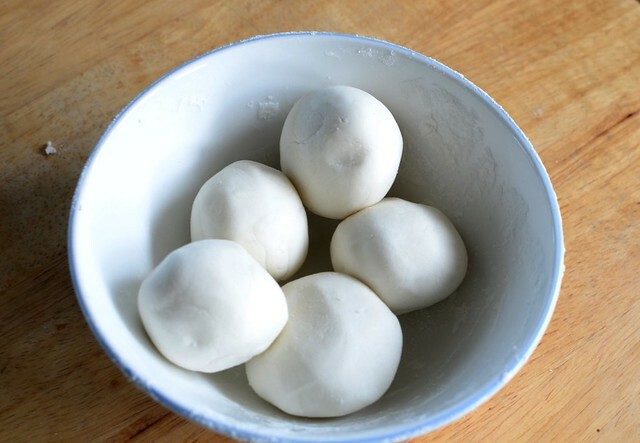 Cover the dough and dough balls as they dry quickly. 6. 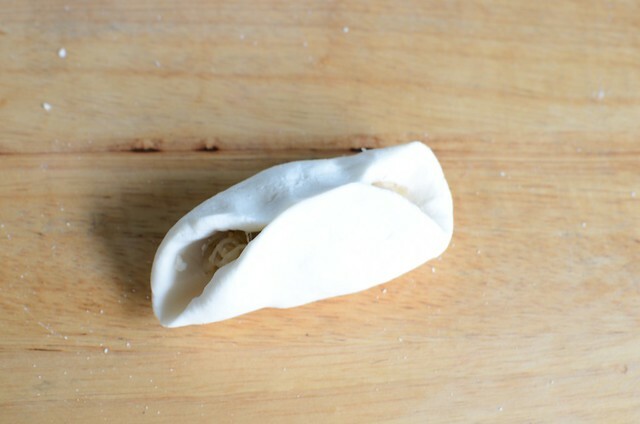 Flatten a dough ball, put 1 tablespoon or more of the filling in the center and fold the two sides together. Pinch the sides to seal. You can either make a ridge along the sealed edges or turn the bun over and shape into a 'pillow'. 7. 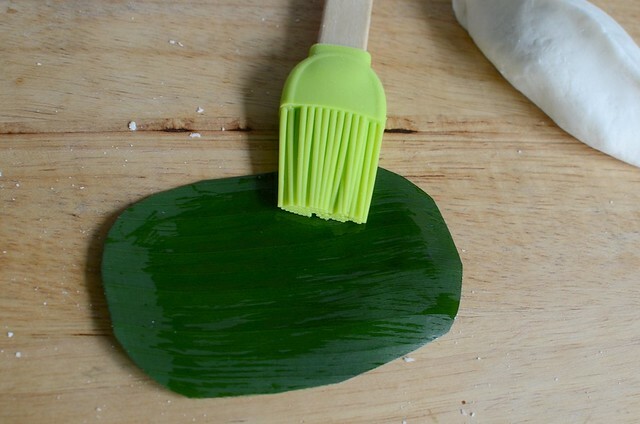 Cut and grease the banana leaves (so the bun won't stick to the leaves), place the filled buns on the leaves and steam 5 minutes for small buns and 7 to 8 minutes or longer for larger buns. When buns are nearly done, brush them with a light coating of veg oil. Thank you for sharing the recipe. I've been thinking about this kuih for a long time. My grandma used to make this and she sometime served it in a bowl of broth. Yummy!